translates to "Pick me up." In the top of a double boiler, beat together the yolks and sugar until pale yellow. In the bottom of the double boiler, bring water to a boil. Reduce the water to a simmer and place the egg yolk mixture on top. Gradually add the Marsala, beating continuously. Cook 6-10 minutes, until soft mounds form, scraping bottom and sides of pan frequently. Transfer the mixture to a bowl, cover, and refrigerate about 30 minutes. Whip the heavy cream with 2 tablespoons sugar until soft peaks form. Fold in the mascarpone cheese and Zabaglione Cream. Cover and refrigerate 1 hour. In a shallow bowl, combine the espresso, 2 tablespoons sugar, Marsala, and vanilla. Dip 1 ladyfinger into the espresso mixture, turn to coat, and remove. Place the cookie, rounded side down in the bottom of a 9 x 13-inch dish. Repeat with additional ladyfingers to cover the bottom of the pan. After you have one layer of ladyfingers in the pan, spoon 1/2 of the cheese mixture over the top. Sprinkle with 1 tablespoon cocoa powder. Repeat the layers 1 more time. Cover and refrigerate 4-5 hours or overnight. 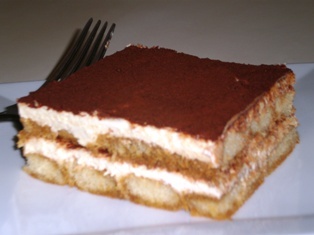 Coat the top of the tiramisu with cocoa powder by shaking the powder through a sieve or strainer. Cut into squares to serve. Modern espresso machines have the technological advantage, but there's much to be said for keeping it simple with a stovetop brewer. While they may not yield a perfect crema, they brew a great espresso. Using it is simple: fill the bottom chamber with water, place ground espresso in the metal filter, screw on the top, and place over medium heat. Pressurized steam forces boiling water up through the grinds and into the upper chamber. Your espresso is ready in under 5 minutes. This white porcelain Italian pear-shaped espresso cup set of 6 is the original and most requested of all espresso cups.